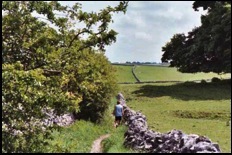 From Monyash along part of the Limestone Way to the upper part of Lathkill Dale and a diversion along Bagshaw Dale. 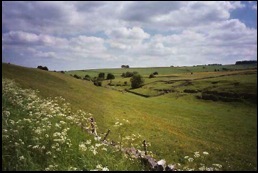 Monyash and back via Cales Dale, and Lathkill Dale. Anne and I are often attracted back to Monyash, located in the Peak District just to the east of the main Ashbourne to Buxton Road. Besides being a very pretty village it is also the venue for the White Peak Walk. Click here for my WebPages on this event. Click Thumbnail to load map of area. . Please note in order to show all the area of the walk certain places I have mentioned, namely Ricklow Dale and Bagshaw Dale, are not indicated by name. But I'm sure you will realise where they are! We had spent the weekend in Macclesfield, which we had used as our base for visiting family in Manchester. We were now on our way home but, as the sun was out, we could not resist the lure of travelling over the Cat and Fiddle Pass and on to Monyash for a little stroll doing one of the best little walks we know. farewell to thetrack and are in the much more open pasture land - the upper part of Fern Dale. However, the dale is only a very minor dip in the landscape and you will probably need to check your map to know you are in it. 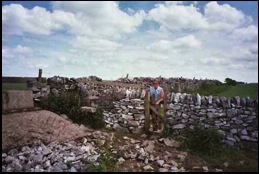 The next part of the walk takes us out of Fern Dale and we follow a wall on our left. 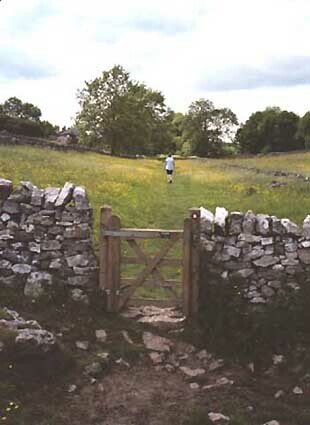 We then go through a gate – a lot easier to negotiate than the old wall stile that can be seen to the left of it. However, soon after, it is necessary to cross the wall on the left and with the wall now on our right follow it down hill, going through a gateway to One Ash Farm. On reaching the main buildings our path goes left and within a few metres we go right where it is necessary to clamber down rocky steps between two outbuildings into the pasture below. From here there is an obvious path down the hillside into Cales Dale.The good news on reaching Cales Dale is that we don’t have to follow the Limestone Way out of it. 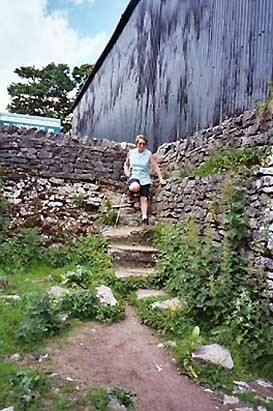 On a hot day, such as the one we were enjoying, the 163 steps out of Cales Dale is a pleasure I’d rather forgo. 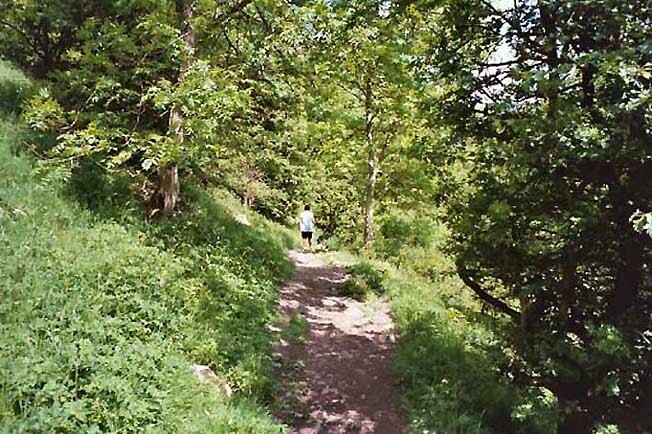 So on reaching the bottom of the dale instead of going over the stile and taking the rocky staircase uphill, our way is left where we enjoy the beauty of this wooded valley before reaching what I consider to be the best part of this walk, Lathkill Dale. I don’t think I could ever get tired of walking in Lathkill Dale. Even in the rain I think I would enjoy it! 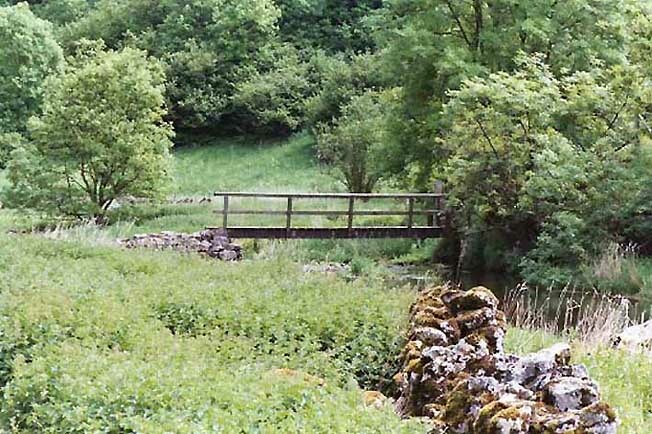 We enter it as we come out of the woodland and then cross the River Lathkill over a small wooden bridge. If we go right we follow the river downstream, where the scenery will become "softer" as it is covered by woodland, particularly on the south bank. 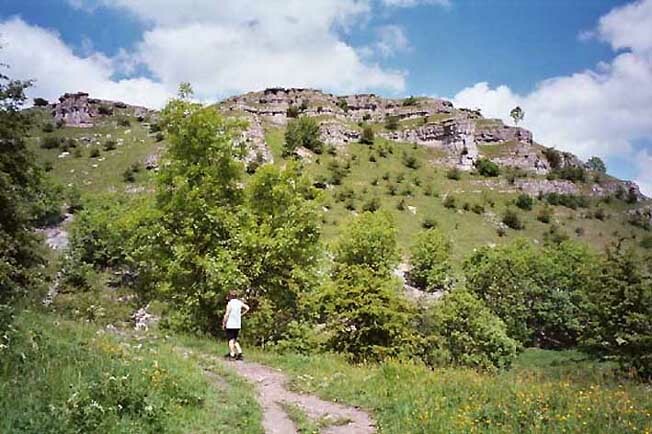 Our route is left up the dale, which is rockier and less suited to nurturing trees on its craggy slopes. However, we did see orchids growing amongst the grasses, but we were probably a couple of weeks too late to see them at their best. 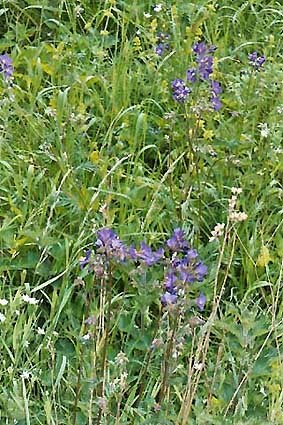 Suddenly, to Anne’s delight, we saw behind an enclosure maintained by English Nature, a host of Jacob's Ladder. Seeing these flowers really made Anne’s day. She had been looking to see them in there natural environment for years and, although Lathkill Dale is one of the few places in England where they can be seen wild, this was the first time we had seen them here. 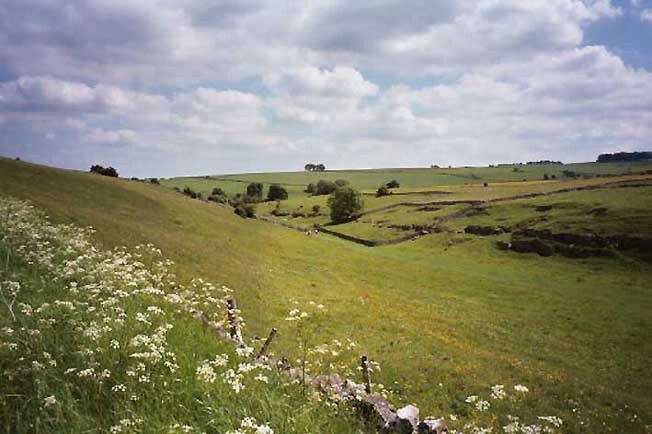 We continue up the dale and soon reach the point where Ricklow Dale comes from the north-west to meet up with Lathkill. 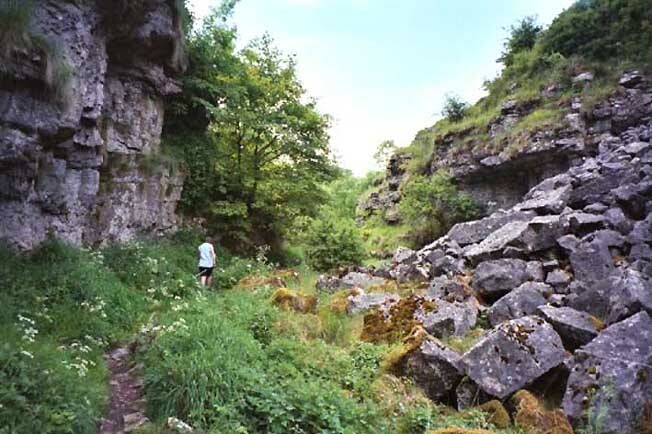 At one time there was much limestone quarrying in this area and, although it has now ceased, the large rocks that gush, almost like streams, over the northern edge of the dale are a reminder of this. 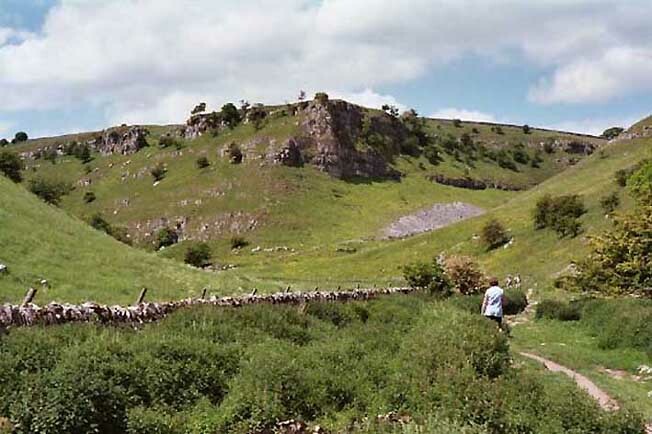 Indeed as a walker going down the dale said "because of the boulders shrewn across the base of the dale you spend more time looking at your feet than you would like in such glorious surroundings". Yes here the landscape is very rugged and spectacular. Soon after, we pass a cave on our left which is the source of the River Lathkill. Today it was dry. However, I have done this walk with Mick, Larry and Ray and we have seen the water gushing out of this cavern. We are now starting to see trees growing through the boulders at the base of the dale. So even more care is required. 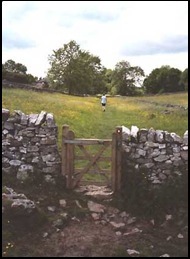 However, soon the path improves and in no time at all we are going through a gate and a short stroll across the meadowland in front will bring us to the Monyash to Bakewell Road. A turn left here – where there are parking spaces and toilets – will take us back into Monyash. 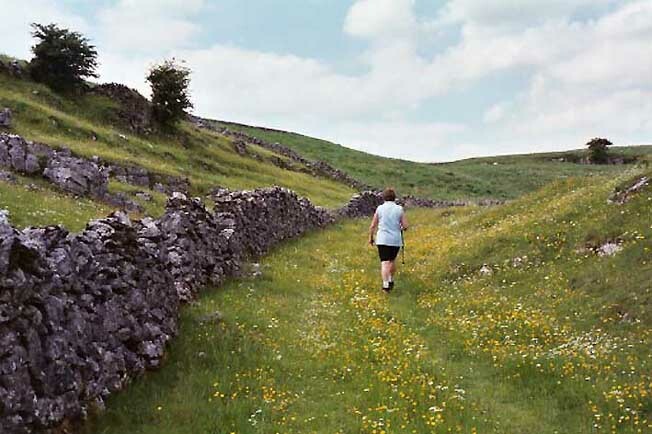 Today instead of walking through the meadow we turned right, almost back on ourselves, and took a path that went over the northern edge of Lathkill Dale before descending into the upper part of Ricklow Dale. It was the first time I had noticed this path, which is a concessionary one provided by English Nature and is certainly not shown on my edition of the OS Explorer Map OL24, which covers the White Peak area. On reaching Ricklow Dale we went north up the dale, over a limestone stile and about 150 metres further on, at a signpost and crossing of ways, we went left over another wall stile. 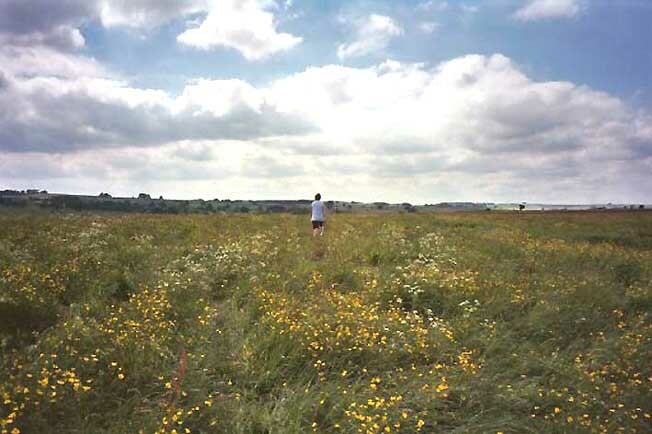 It was then up the hill and across meadows, covered in buttercups, until the Monyash to Buxton Road was reached. 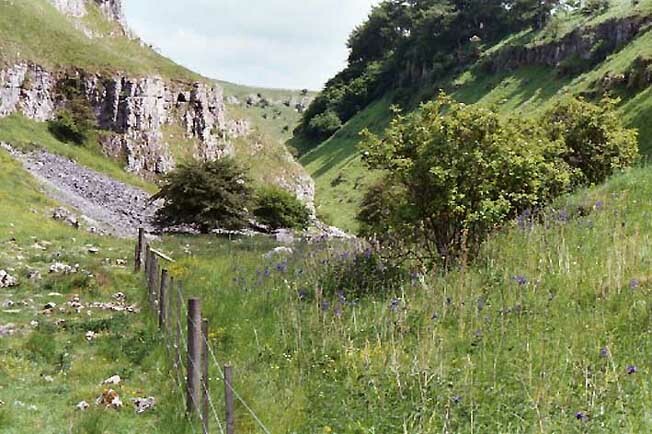 From here it was downhill to the previously mentioned parking and toilets at the entrance/exit to Lathkill Dale. 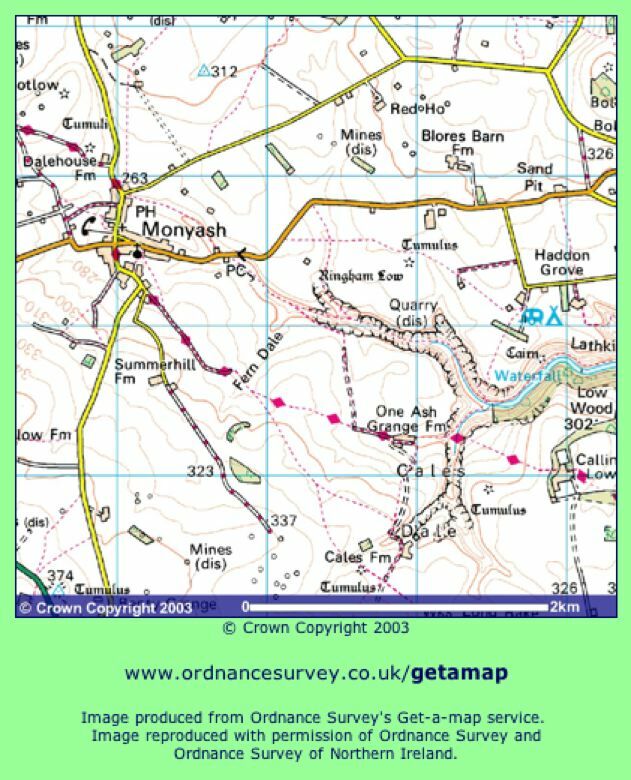 Instead of following the road straight back into Monyash, immediately past the toilets we crossed the road and took the signed right of way into Bagshaw Dale. I would imagine that at least 90% of the people walking Lathkill are not even aware of this very pleasant diversion. 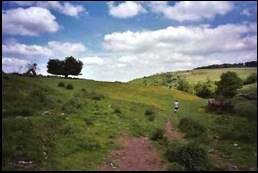 It is a very ordinary dale compared with Lathkill and more akin to Fern Dale in size. 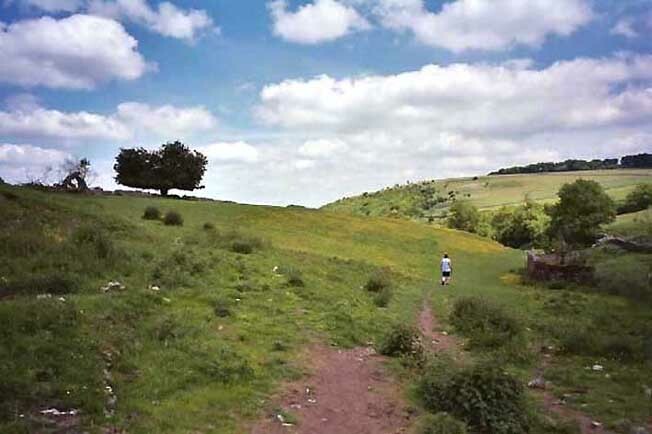 However, it is a very pleasant stroll but, regrettably, in no time at all the end of the obvious track is reached and we leave the dale and walk into Horse Lane, the main route between Monyash and the nearby village of Sheldon. Here we turn left, and then left again at the Monyash to Flagg road and suddenly we are back in the car park where this ramble started. I suppose the total distance walked with the two diversions is not much more than 4 miles. It took us 2 ½ hours to complete with numerous stop to admire the scenery. Yes, we could have done it quicker but it was too good to rush.